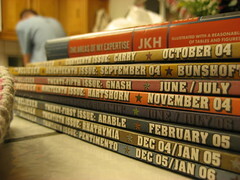 Add Hunger Mountain to the list of literary journals that charges a reading/submission/administrative fee for non-subscribers. I don’t know how recent this change is, but I submitted to HM a few months ago without a charge. It’s either a recent development, or, you know, the real reason for that kind rejection letter. The Believer just tweeted “8000 Facebook fans! When did that happen?” Good for you, The Believer. Sufjan Stevens on Spotify is my submissions soundtrack. As in literary submissions, not cool grappling lessons. That would be hilarious. What’s your take on lit journals charging submission fees? The day Cocca failed the Turing Test.